If you’re like me, Halloween sneaks up on you (get it, sneaks up?). It’s “Yea! Fall is here!”, followed shortly by, “Aaahhh! I have to get costumes!”, and then the hair on the back of your neck stands up as you realize the babies will only be little for a few years and then they will be, “like so over spooky silly Halloween” and you will turn into the slutty costume police. Ughhh. We are busy people! We have kids, jobs, husbands, practices, meetings…too much to cram in one month! I have decided lately there is Pinterest time (full of way too many ideas) and then there is real life Mama time. So, in pure last minute fashion, I have rounded up some ideas of little things you can do to help your family get s’more out of Halloween. I know, I’m a goober…probably why I’ve had so much fun this week. Happy Haunting! Raid your pantry: You can find stuff to make spur of the moment tricks & treats. There are apple mouths made from apple slice lips, peanut butter gums, and marshmallow or yogurt covered raisins as teeth. Bananas with mini chocolate chip eyes make cute ghosts. 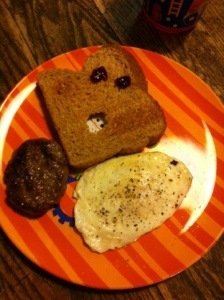 Turn toast on diagonal, give it jam eyeballs, and cut a hole for the mouth. Use hot dogs or little smokies and crescent rolls to make mummies. Raid your craft closet: pipe cleaners make impromptu spiders and I found pencils, erasers, stickers, spider rings, vampire teeth, pumpkins, and other treats from past Halloweens long forgotten. Get a little creative. Lovezilla was on my same easy-peasy mood with donuts or bagels sporting vampire teeth. Going to grab donuts after school today and serve them up in the morning. The Moe’s Family Mama came up with cute monster eyes in hot chocolate. Btw- her house looks gorgeous! if it really dies cool off after this rain, I am so ending our night with this! Giant marshmallows with chocolate chips or chocolate malt balls stuck in them, floating in a warm cup of cocoa. Oooohhh, yeah. Caramel Potatoes showcased a version of Pumpkin Soda Bottles. I modified it for a too quick and super cute way to dress up orange soda bottles. Drop in and pick a couple up on the way to carpool, peel the label off and doodle on them while you wait and viola….Best Mom Ever (especially if your kids are like mine and soda is a special thing). Thank you Ma’am. Need more? Hit any local dollar store and they are sure to have cute little Halloween trinkets for cheap. Still not satisfied, check out my Fall Holiday Pinterest board. Trust me, there’s plenty to keep you from sleeping a full 8 hours.